3 Youth Plaintiffs from Our Children’s Trust met Bernie Sanders! It’s a Friday night at the Good Shepherd Center in Wallingford, and Joey and Grace, ages 9 and 11—tiny, wiry, and ebony-haired—are tumbling over each other to tell me what they know about climate change. Their introduction to the concept is pretty difficult to pinpoint, though, since it’s always been there, “like all those other facts,” says Grace. “It’s just, like, a regular thing,” adds Joey. Still, for my benefit, the siblings cast their minds back to the old days, when they knew about climate change, but they didn’t know that much about it. “We knew it was caused by people burning oil and gas, but we didn’t understand what it meant,” offers Grace. “Something like that,” says Grace. They share their feelings about that. We’re at the tail end of a monthly meeting of the Seattle chapter of Plant for the Planet, an international environmental club with 34,000 young members in 50 countries who have collectively planted more than 14.2 billion trees. There are snacks and games, as you’d expect at a kid meeting—muffins, cookies, carrot sticks, a swift round of hide and seek, some dashing about and shrieking and breathless laughter. But mostly it’s quite serious. Moderated by the group’s 13-year-old president, Gabe Mandell, the young activists are celebrating the myriad climate wins of 2015—Shell is out of the Arctic! Obama vetoed Keystone XL!—and planning their next tree-planting workshops and retreats, as well as discussing the climate news of the day, such as the Trans-Pacific Partnership, a controversial trade agreement that could allow multinational corporations to skirt carbon policies. These are the kids, aged 8 to 14, who’ve trained to become “Climate Justice Ambassadors”—the official title of every member of Plant for the Planet who participates in a day-long “Academy”—giving ebullient speeches to their peers at school and at climate events. They’ve shown up at Shell, Keystone, oil train, and Gates Divest protests; they’ve testified at climate conferences and hearings; they’ve urged the Seattle City Council to put warning labels on gas pumps. They’ve also spent time with Governor Jay Inslee and former Vice President Al Gore and been featured in the HBO documentary Saving My Tomorrow; they’ve planted 11,000 trees and started a state-level challenge to plant a billion. They’ve co-hosted workshops and trainings all over the Puget Sound area and inspired the creation of a Plant for the Planet chapter in Portland. They’re about 375 strong since their inception in early 2013, with a few dozen active members. And eight of them were plaintiffs in a highly publicized lawsuit petitioning the Washington State Department of Ecology to develop a carbon-emissions rule for the sake of their fundamental rights—a lawsuit that they almost won. If you, like Sierra, are 11 today, you were born not long before Hurricane Katrina struck New Orleans. Then, nearly every year of your existence, the world has seen epic climate-related disasters: Hurricane Sandy, Typhoon Haiyan, massive flooding in Pakistan, Pacific islands slipping underwater, Alaskan villages toppling from coastal bluffs, endless drought in California, and catastrophic wildfires in Washington. Every year seems to surpass the last as the “hottest year on record”; 2015 just beat out 2014 for the highest global average temperatures ever recorded, and 15 of the planet’s 16 hottest years occurred after 2001. Also, if you are 11, you were born just before the release of Al Gore’s An Inconvenient Truth, which marked a sea change in public perception around the concept—in this country, anyway—making “global warming” and “climate change” household terms as well as the stuff of political debate. More recently, you saw one of the largest international summits ever convened on this or any topic, and President Obama has been making climate speeches almost since you could speak. By some accounts, we are beyond predictions and have entered the age of climate consequences. The entire lifetime of today’s children falls into that age. In 2050, the year that some of the more dire climate scenarios could begin to unfold, an 11-year-old will be 45. The kids’ passion has made an impact on the local climate movement. Put onstage, they frequently pull grand, tearful statements—and sometimes actions—out of our elected officials. Kids speaking up for themselves, for the planet they’ll inherit—it’s effective. 350 Seattle has been known to call these kids their “secret weapon.” But it’s not just some cheap ploy to fill out a climate agenda: The weapon works because the kids care, too. The journey to Plant for the Planet in Seattle began with a single Google search. The kids got their final day in King County court last November; they’d been petitioning the Department of Ecology to create a carbon-emissions rule based on the best available climate science since summer 2014. While they lost their case in the end, Judge Hollis Hill nevertheless created a legal precedent that thrilled climate activists: the idea that the Washington state constitution should in fact protect the atmosphere for future generations. According to Judge Hill’s ruling, the only reason she dismissed the kids’ case was because the Department of Ecology was already developing a similar rule. Notably, Ecology is developing that rule because Governor Jay Inslee ordered it to last summer—11 days after he spent 90 minutes listening to five of the kid plaintiffs asking him to do just that. Meanwhile, Senator Doug Ericksen (R-Ferndale), chair of the Energy, Environment, & Telecommunications Committee, has sponsored SB 6173, a bill that would overturn Ecology’s ability to make a carbon rule without the help of the legislature. The proposed rule, said Ericksen in a statement, “gives manufacturers a perverse incentive to leave the state of Washington.” The bill passed his committee and is now in the hands of the Rules Committee, which may send it to the Senate floor for a second reading. According to Michael Foster, climate change is a “time crime.” We’re stealing the future from our children by burning fossil fuels with abandon, and we won’t really know it—we won’t know quite how much we’ve stolen—for decades. While some of the kids are interested in science or enjoy being mini-celebrities—it is nice, as former Planet for the Planet president Wren Wagenbach told me, to have somebody “listening to you, for once”—they often have very strong emotional connections to the issue, too. Last summer, 12-year-old Jenny wrote Governor Inslee a letter describing her attachment to a lake and a waterfall in a forest in China: She’d go every year to visit family, but one year when she returned, the forest had been cut down and turned into oil-slicked pavement. It’s not just guilt, then, that makes climate-caring adults lose themselves in the kids’ speeches. It’s also because they’re kids—so optimistic, so emotionally raw, so guileless. They put things in simple terms; they force us to interrogate our own assumptions; and they are utterly convinced that this is a problem we can fix. As I wrap up my conversation with Joey and Grace, Grace insists several times that I include one very important piece of information in this article. “We need funding,” she says. Planting trees, alas, isn’t free. But “it’s only one dollar per tree! It’s not much!” I promise to mention it. Parents grab their kids’ things, someone plays a riff on the piano, tiny hands grab extra cookies and tiny sneakers squeak as a dozen or so children skip off into the wet night. Just outside the door, Gabe Mandell reels off some of the intricacies of the Trans-Pacific Partnership. “Do you want me to tell you the two worst things about it?” he asks, then launches into an explanation of the Investor-State Dispute Settlement (ISDS) provision, which would allow corporations to sue governments over laws they find too restrictive in private trade tribunals, and if they establish the tiniest subsidiary in a country that has lax carbon or public-health laws, they can opt to abide by those laws, instead of the countries they do most of their business in. He then takes care to remind me—although, at this moment, I’m quite convinced—that this is not just kid stuff. Sara Bernard writes about environment and education, among other things, for Seattle Weekly. She can be reached at sbernard@seattleweekly.com or 206-467-4370. Follow her on Twitter at @saralacy. Help get 2 USA Ambassadors to the Plant For The Planet international conference in Germany! Climate Change For Families (Plant-for-the-Planet in Seattle, USA), a 501(c)(3) organization, needs your financial help to defer the $4,000 cost of the airplane tickets for Climate Justice Ambassadors 14-year old Aji & 14-year old Wren, along with their adult advisor Michael Foster, for their upcoming trip to Germany to participate in the May 17 to 25th International P4tP conference to finalize the Youth Climate Plan prior to the Paris December 2015 G7 summit. Yes, it is unusual for P4tP Seattle to take such a trip. But we’re now in “crunch time” to save Mother Earth, and it is extremely important that these Climate Justice Ambassadors attend and have input towards shaping/controlling their future. They are the only 2 Ambassadors representing North America at this conference. As Michael Foster says: “We’re only doing this to save the world!” Thank you for your generosity. 2 Academies in Seattle October 26th! Free for all students ages 8 – 14. Imagine planting a million trees, what you would feel like, how you would change the world…? Now get started! 160 students ages 8 – 14 from area schools will train to serve our community as Climate Justice Ambassadors! Worldwide, over 19,000 students have attended this fun and educational Academy training to join forces worldwide as leaders of the Official Tree-Planting Campaign of the United Nations. The following weekend we celebrate in parks with hundreds of families to launch Green Seattle Day, the first day of tree-planting season in Seattle! Ambassadors can invite friends and families to come plant thousands of free trees sponsored by Seattle Parks! At the Academy, we play experiential games to understand how our world needs care, learn to plant a tree properly, get a photo with local leaders, and rehearse an amazing slideshow on Climate Justice. We conclude the Academy by presenting the slideshow to invited guests and take a graduation photo. Students, age 8 – 14, who care about our future and want to start a “tree-mendous” transformation of our planet, please attend this one-day workshop on October 26th. At 4pm, families and invited guests come see the student slideshow presentation at the conclusion of the Academy. Make plans to attend with the whole family to experience this powerful work from the world’s newest Climate Justice Ambassadors! Thanks for support to the Seattle Parks Dept, and Coolmom for help making this a free event, open to all students! To learn more, go to the “About the Seattle Plant for the Planet Academy” page. Questions? Contact us below in comments. We need to be out in the streets. For Them. To stop the one problem that threatens LIFE as we know it. Moms Against Climate Change ‘Demonstration’ from 567vfx on Vimeo. If they knew, our kids would teach grownups to clean up our mess, to sharpen our fuzzy awareness of their climate emergency. The actions we take today quite literally shape the world they inherit. The generation born in this new century will barely be able to drive or vote or drink, when they pass the final threshold of irreversible CO2 and the chance to do something meaningful about climate change has gone. If we start now, drastically and with great effort, we might do the impossible. If we don’t try, what will we say to them, and the next 7 generations. We grownups need to use care to reinvent and rebuild our lives, our food, our work, and our energy in ways that leave a world for our kids. And it’s not enough to reduce my own footprint. I’ve got to help you reduce yours. You’ve got to help everyone you know. Our only chance at large-scale change requires all of us helping each other change. Children, direct and guide us, the grownups, to live for tomorrow now. This weekend the 350.org Columbia River Climate Action will protest the plans to expand fossil fuel exports on the Columbia. “Portland Rising Tide” is hosting a teach-in, music, speakers, and ACTION on the river this Saturday. See the calendar (at right) for more details. If you are in the Portland-Vancouver area, or want to ride a bus down for the day, make your voice heard by joining together to put a stop to the new coal, LNG, and tar sands export schemes. A beautiful, moving video from the iMatter Earth Day March back in April, reminding us to love our kids, and our only home. Our children have some strong words for us to hear and honor. They depend on us to protect their future. The children were protesting the proposal to expand coal exports through Seattle and the Northwest from 2 – 3 trains per day to 18 – 37 trains per day, so Peabody Coal can sell it as quickly as possible to Asia for the next few years. The additional CO2 emissions will more than equal the emissions from the Keystone XL pipeline if allowed. On Friday, 80 students from 13 different Seattle schools attended the free Academy for the international children’s organization Plant For The Planet. In only 6 years, over 18,000 students worldwide have trained as Ambassadors for Climate Justice, who give presentations on climate, and organize tree-planting. There was plenty of laughter, fun, snacks, and sunshine, but the working sessions were all business, with a very serious plan to literally change the world. The Plant for the Planet goal: to train 1 million Ambassadors worldwide, and plant 1,000 Billion trees by 2020. So far, they have planted so many trees that they were given the official Tree-Counter of the United Nations Tree-Planting Campaign and have counted 12.5 Billion Trees planted! The day-long Seattle Academy was held at Golden Gardens Bathhouse, a beautiful brick building in a magnificent park, one of the first places in Seattle that these children will see flooded from rising sea levels if we don’t take action. The Seattle Mayor’s office and Seattle Parks donated the use of the building for the day, free of charge. 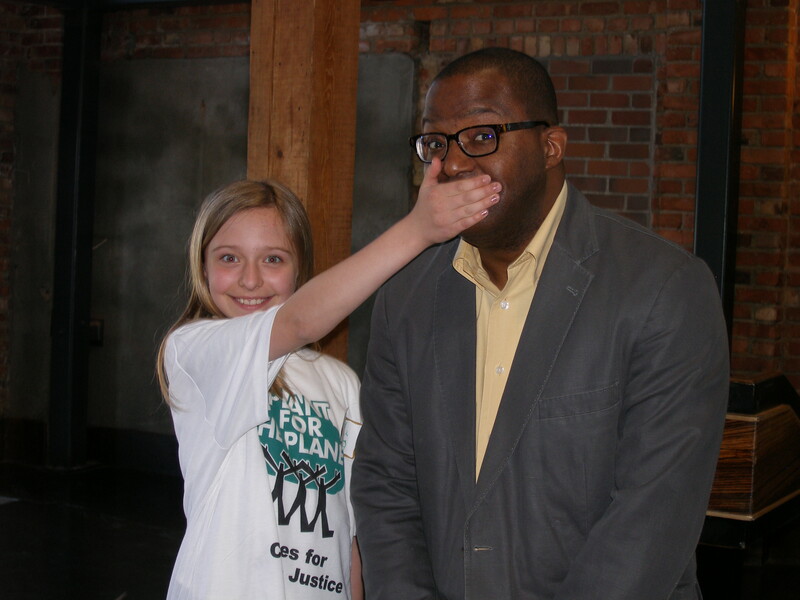 The Deputy Mayor of Seattle, Darryl Smith, attended the children’s climate presentation and said it was “the best presentation he’d seen on climate change,” giving the most cohesive description of the both the problem and the solution. The Deputy Mayor commented that coal trains roll through Golden Gardens on their way to export terminals where the coal gets shipped overseas for burning. Stopping the coal trains is one of Mayor Mike McGinn’s top priorities. Leave the Fossil Fuels in the Ground, eliminating the source of our CO2 emergency. Plant 1,000 billion trees by 2020, to reduce the amount of CO2 in the atmosphere as quickly as possible, buying us more time to address the crisis. Combat global poverty in developing countries with a carbon fee, so that nations that want to burn more than their fair share pay other nations who don’t use their own fair share. The fee would be based on each person on earth having a “fair” amount of CO2 to burn, currently 1.5 tons per person, the maximum amount we can emit and still avoid crossing the threshold of 2 degrees Celsius warming. The ambitious plan solves global warming in this lifetime, avoiding a global catastrophe. Anything less is not an option for these children. What humans do now and until 2020 matters most of all, because we put another 90 million tons of greenhouse gas pollution into the atmosphere every day. Currently the average person in the USA burns about 18-20 tons per year, or 10 times the fair amount allowed if we want to avoid disaster. Here in the USA, we have to reduce our emissions twice as much as most wealthy nations, who have been seriously reducing pollution for decades. By the time these children are grown and in positions of power, 2o years from now, it may be too late to do anything about it. Let’s all support these new Ambassadors, who have their work cut out, spreading the word about the crisis and the solution, both in Seattle and nationwide, getting support for their global plan, and getting governments, companies, and families to plant more trees right away! Plant-for-the-Planet Global Boards need Youth Candidates from the U.S.A.
How would you like to be a leader in a democratic global youth organization that has begun transforming the planet one tree at a time? Sounds like a dream, doesn’t it? You have to be old enough: 8 years old and under 21. If you are 7 and a 1/2 you’ll just have to wait a little while. And you have to be elected. Candidates from North America are sought for the Youth Board, ages 15 – 21. Apply now to become member of the new Global Boards 2013/14. The online-voting for the new Plant-for-the-Planet Global Boards 2013/14 starts on 27th March! · Do you want to deepen your involvement with Plant-for-the-Planet? · Do you want to take extensive action to fight the climate crisis? · Do you want to inspire children worldwide and represent their interests? Then apply for the Plant-for-the-Planet Global Boards 2013/2014! Again, there will be two Global Boards: one for the Children’s Initiative, for children aged from 8 to 14 and one for the Youth Initiative, for young people aged from 15 to 21 years. Together they will represent the Plant-for-the-Planet Initiative, which invites everyone around the world to become a member. In each of the Global Boards there will be 14 members who represent 7 different world regions. You can be a part of it too. Exchange ideas and opinions with people from around the world and help to take Plant-for-the-Planet into the future! You have until 22th March 2013 to apply to sit on one of the Global Boards. The candidates be presented on our website, if possible with a video message. The elections will start on 27th March 2013 online. Every Plant-for-the-Planet member with voting rights has until 19th April 2013 to register their online votes for each of the Global Boards. From these elected board members, the Global Presidents and Vice-Global Presidents will be elected. They are voted for in a second round of voting from 20-27th April 2013. The new Presidents and Vice-Presidents will be presented at the Plant-for-the-Planet Annual Meeting in Munich. The handover from the old Global Boards to the new takes place in June, and the new Global Board takes office on 1st July 2013. The current Global Board members can be seen here. It would be great if you could forward this invitation to interested students. Thanks a lot! If you are interested or know a youth who would like to be on the board, please contact me or Plant For The Planet now. I’ll be happy to share more information.